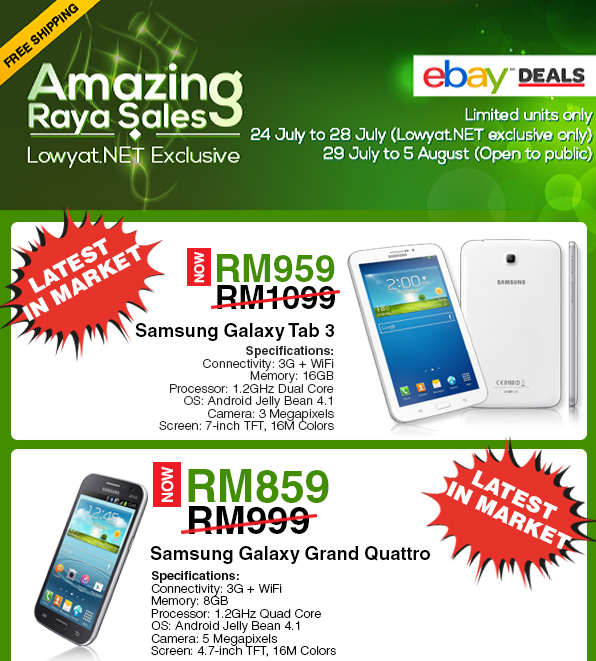 If you missed out on day 1 of the Lowyat.NET pre-sales with eBay Deals, don’t worry, you still have your chance to be one of the first to own the brand new Samsung devices – Samsung Galaxy Grand Quattro and Samsung Galaxy Tab 3. Officially announced just days ago, the Samsung Galaxy Grand Quattro comes with a retail price of RM999, but eBay Deals is offering it for only RM859. If you’re in for something a little bigger, they are also offering the yet to be announced (by Samsung Malaysia) Samsung Galaxy Tab 3 7.0 16GB (Wi-Fi + 3G) for only RM959 (RRP is RM1,099). Only limited number of units is available for each model so you better grab them fast before they’re gone. This pre-sales is a Lowyat.NET exclusive offer click on this link to check out what they have got to offer. There are other gadgets and accessories as well, but the stars of the show are none other than the Galaxy Grand Quattro and Galaxy Tab 3. Happy fun shopping!